Join me in celebrating the Daily Office, a treasure of the Episcopal Church’s Book of Common Prayer which promotes hope through daily prayer and the reading of Scripture. The reflections I offer here usually spring from some word or phrase that jumps out as I pray the Office. It may be from one of the psalms or readings, it may be from a collect or prayer within the Office, or it may come from some interesting echo or juxtaposition. I hope you will find these reflections interesting, but even more I hope they will encourage you in your own practice of daily prayer. The Daily Office is a rich blessing in my life, and I hope it will be in yours. The photo above is of my grandfather, the Rev. J. Rodger McColl, on the steps of the DeKoven Center in Racine, Wisconsin sometime in the 1940s. In the background is a page from Morning Prayer in his BCP/King James Bible combination. 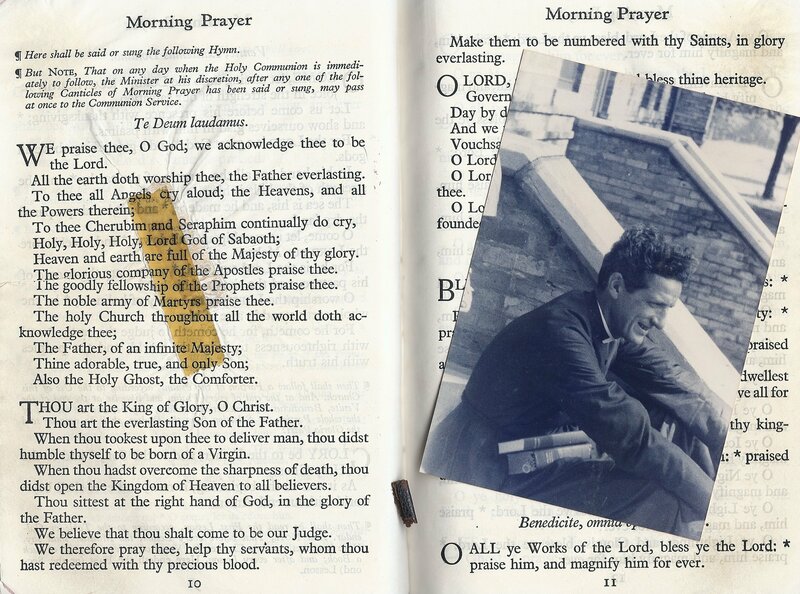 The oil stains from his fingers on the pages of the Offices and the Psalms and the yellowing cellophane tape holding the pages together are testimony to a life of daily prayer. Howdy from Texas! I just came across your blog, and am a fellow devotee of the daily office. Hope to read more posts in the future! Me too, in sunny Arizona. thank you for this great website. You’ve enriched my devotion. Ran across your blog site looking for art related to the foot washing. You have a picture of a sculpture of the foot washing by Jesus (I think it was in August.) Could you tell me where the statues are and if it is possible to obtain permission to use it in a distance education course I am developing on the Gospel according to John the Pastor? I have see several other views of the sculpture but found yours most moving. I intend to visit your blog frequently. Interestingly I visited the De Koven Center in the late 50’s. The artist is Max Greiner, whose webpage is http://www.maxgreinerart.com — you’d have to seek his permission or give credit to him if you use a photo (as I should have done! ).